The Seward reunion continues. This is the view from the picnic area on Saturday evening. I don't remember it raining much but it wasn't sunny either. 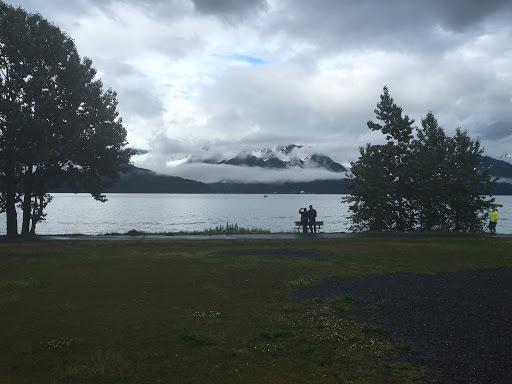 In fact, it has looked like this the entire time we've been in Seward. The cookout turned out to be pretty good with some food items completely gone but there were some leftovers. After the picnic, most of the family adjourned to a large house that one of the families had rented overlooking the bay. But not until about eight or ten people got their Ural rides. Some folks in town must have wondered why I kept riding around as I sort of kept the the same route. On Sunday morning, I went to the Alaska Sealife Center for a short visit with my son. We ran into quite a few relatives there as admission was part of the reunion registration fee. (Yes, there was a registration form, fee, etc.) After the Sealife Center, I headed out to the Seavey dog sled attraction. It was pretty busy and our reunion group alone needed to be divided into six groups of eight. This snapshot was taken from the cart as we were taken on a two mile route. 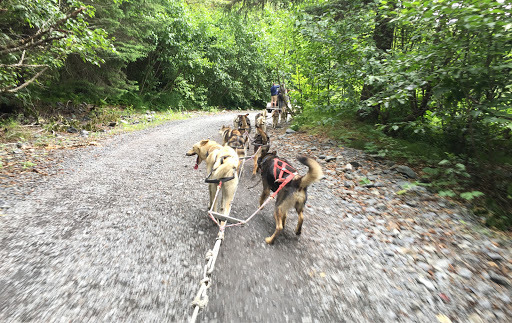 There were fourteen dogs pulling each cart and ours had several members of the Iditarod champion team. The attraction is part of the training for the dogs. At a couple of times when the trail split, just a one word command changed their direction almost instantly. What a fun event. Somebody must have gone the extra mile to make this happen. Respect! I have been on a dog sled tour during winter, and we were trained how to command the dogs. I can tell you those dogs had their way with us noobs. That would be Bridget, my brother and sister in-law and my sister that organized it. Sounds like a great success, very happy for you. How cool that the dogs got to take you for a ride. Now who had more fun - folks riding in your Ural or the dog sled ride?